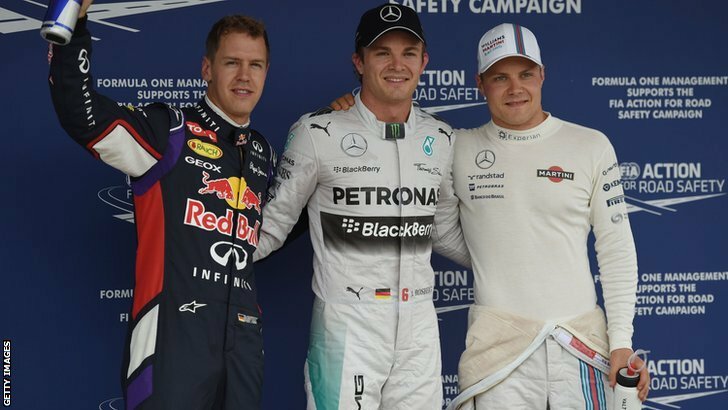 Home » Formula One: Rosberg on pole as Hamilton's car ignites! 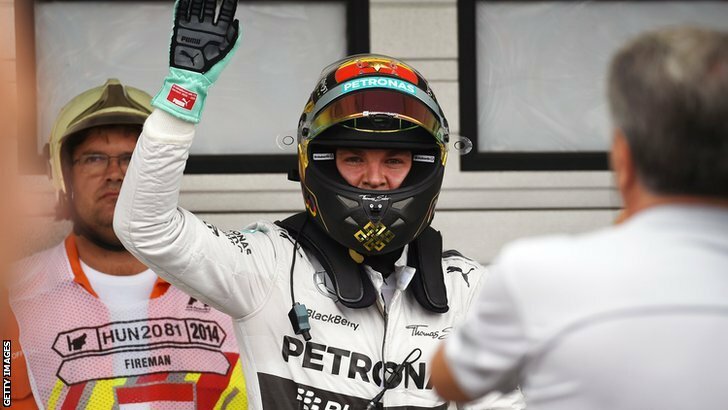 Nico Rosberg has claimed pole position for the 2014 Hungarian Grand Prix after a dramatic session where team-mate Lewis Hamilton was eliminated in Q1 for the second week in a row after his car caught fire. The Briton will start from 21st on the grid after a fuel leak ignited the rear of his car. Sebastian Vettel will line up alongside Rosberg on the front row after having the top spot stolen from him in the last moments of the final session. Valterri Bottas put his Williams in 3rd to split the two Red Bull’s with Ricciardo grabbing 5th. With Hamilton taking a hat-trick of first places in all three practice sessions, the Briton was hoping to end his qualifying hoodoo by getting pole position in Hungary. The heat was ramping up the drivers left the pits, but there was a chance of rain on the horizon. Pastor Maldonado’s session was over almost immediately as his Lotus ground to a halt at the pit-lane entrance. He will line up last on the grid as the ever present technical gremlins return after a smooth weekend so far for the Venezuelan. The next retirement from the session came just a few minutes later. Unbelievably it was Lewis Hamilton! The bad luck had followed the #44 Mercedes as fire billowed from the back of the car. 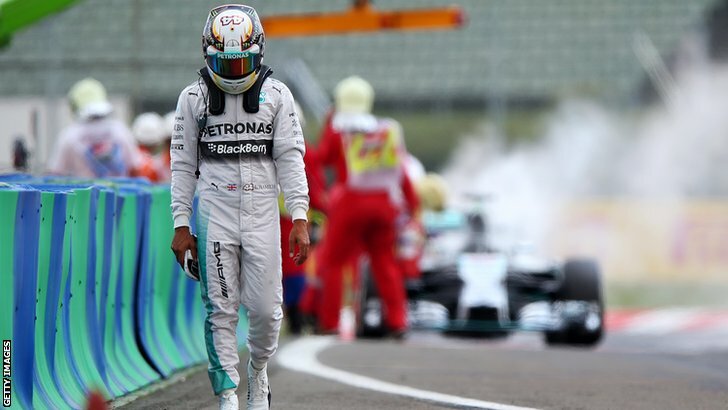 Hamilton managed to roll his car into the pit-lane and stopped in front of a group of fire marshals, who after a few minutes managed to get the car extinguished as the anguished Hamilton walked away from his smouldering steed. With his team-mate and title rival doomed to the back row of the grid, Rosberg wasted no time in putting his car fastest. He wouldn’t keep it however as soon some drivers came out on the faster compound tyre to try and see themselves into the second session. Jean-Eric Vergne ended the session fastest for Toro Rosso. With Maldonado and Hamilton already out of qualifying, only 4 more drivers would be eliminated. This was a great opportunity for an unlikely name to get through to Q2. Nico Hulkenberg was on the cusp of elimination in P16 before he put his car further up the order after a good lap on the faster tyre. Ferrari thought that their driver Kimi Raikkonen was safely through to the next session and was left in the pit-lane as the final laps concluded. Bianchi had lost a little time in the middle sector of his final lap but managed to bring it back in the final sector to eliminate Raikkonen. Performances like this will almost certainly put Bianchi, a member of the Ferrari driver academy, in the prime seat to take a seat at the Scuderia in the near future. The two Force India’s led the car’s out on to the track for the second session of qualifying. Neither of the Sahara cars had amazing pace however, with Kvyat eclipsing their initial times. Felipe Massa then came through to take P1 before team-mate Bottas took the fastest time of the weekend to go half a second faster. Valtteri’s efforts weren’t enough to hold back Rosberg however, with the German going 7 tenths faster than the Williams. The two Red Bull’s showed their improved pace as they went 2nd and 3rd shortly afterwards. Sergio Perez’s session ended prematurely after a hydraulic issue. He had set a time but it wasn’t good enough to see him through to the top 10 shoot-out. Daniil Kvyat was just ahead of the Mexican and was on course to make it through to Q3 after setting two personal best sectors on his final lap. 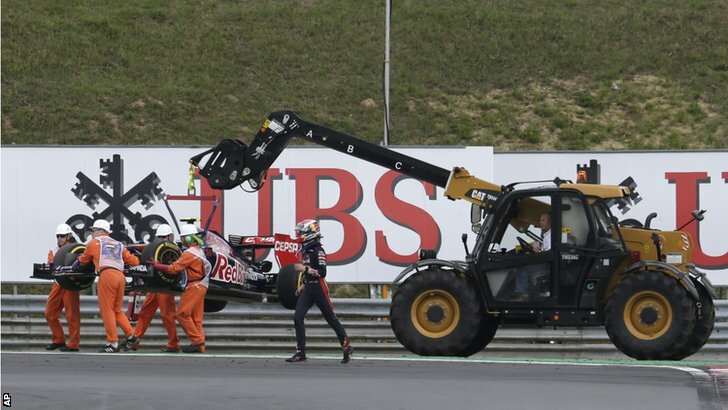 However as he approached turn 12, the rear of the Toro Rosso snapped round, spinning the Russian. He wasn’t able to get the car moving again and would be unable to lift himself out of elimination in P11. The two Sauber’s, Grosjean and Bianchi would also not advance into the final session. With Hamilton eliminated in Q1, it looked as though a repeat of Hockenheim was on the cards as Rosberg had no realistic challenger for pole position. However, as the session got under-way, rain started to fall. The drivers were queuing at the pit exit so that they could attempt to beat the rain to set a dry time before it became impossible to do so. Rosberg managed to start a flying lap first, but on the approach to turn 1, he found that grip was not there for him as he slid off into the run-off area. He managed to get back on track unscathed, unlike rookie Kevin Magnussen who was next on the scene. The McLaren driver was unaware of the lack of grip into turn 1 and locked up both front wheels. He was unable to regain control and as a result went straight into the tyre barriers in quite a hard hit. The Dane was able to get out of the car no problem, but the session had to be red flagged to avoid further incident. Once the session was restarted, Rosberg got a very cautious lap under his belt, but it was soon annihilated by Ricciardo and then Bottas, who went fastest by over a second. Rosberg soon got more confidence in the conditions and beat Bottas’ time by just a tenth of a second, with Vettel soon taking 2nd away from the Finn. The drivers soon began their final runs. As the clock his zero, Rosberg’s pole position wasn’t looking as easy as he thought it would be following his team-mate’s fire. Valtteri Bottas put in another lap to go just behind Rosberg, but it was Sebastian Vettel who got it all hooked up to take away provisional pole by just a few thousandths of a second. Rosberg had to make his last lap count, which he did. He was one of the last drivers over the line as he took another pole position by 4 tenths of a second. Vettel kept 2nd place ahead of Valtteri Bottas, with Ricciardo getting 4th just ahead of Fernando Alonso’s Ferrari. Felipe Massa put his car 6th and will be hoping to make it past lap 1 without incident this weekend. Jenson Button and Jean-Eric Vergne share row 4 of the grid, with Nico Hulkenberg taking 9th ahead of the bruised Magnussen in 10th.